Our Vet tech superstar, Anne says “These pets are so well socialized and loved.” Anne reports fond memories of her first volunteer experience with Vet SOS, saying “It was Thanksgiving in Golden Gate Park and we all ate turkey out of one of the veterinarian’s trunks.” Anne says she wants to volunteer with Vet SOS forever and become the “oldest volunteer standing.” Anne shows her puppy love towards “Biscuit” (here). Vet SOS’s very own “Dr. Phil” examines a pup at our Valentine’s Day clinic. Longtime volunteer, retired veterinarian Dr. Phil Durfee, has been a consistent presence in Vet SOS for years. He says he volunteers with Vet SOS to help those who love their pets but lack the resources to pay for veterinary care. Vet SOS’s Veterinary Services Coordinator, lead veterinarian volunteer Dr. Margaret Hoppe, provides medical oversight of the veterinary services we provide to ensure a high quality of care. She attends almost all of our clinics, where clients love consulting with her about their beloved pets. 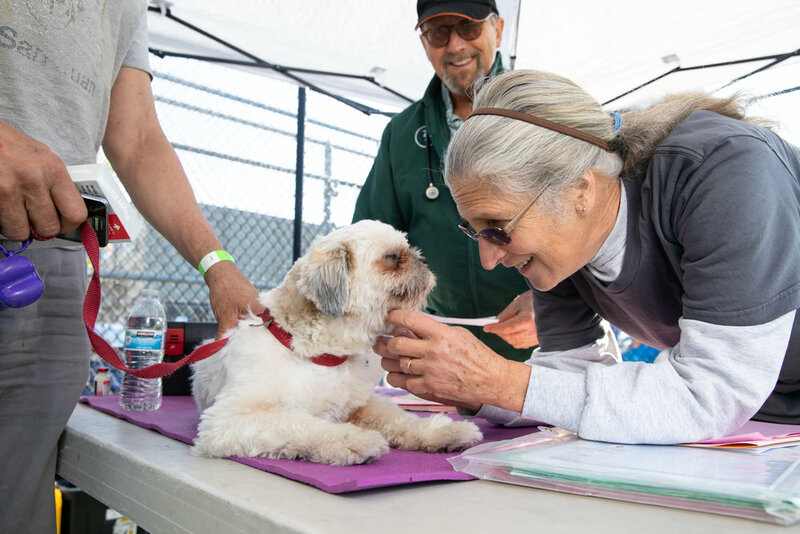 Vet SOS founder and first Veterinary Services Coordinator, veterinarian Ilana Strubel, established key partnerships with all the major non-profit animal service providers in San Francisco, allowing our clients to receive services well beyond the capacity of any one agency. Dr. Strubel's family and friends were our first donors and her Vet SOS legacy continues today.